I thank Tiny at Tiny Lessons Blog, Renee at Positive Boomer, and My Pen and Me for providing the last three stars for my blog for “Blog of the Year 2012” award. I am grateful for this generous honour and the people who follow Teacher as Transformer. It is a reflective, creative, and transformative journey. This is a result of the wonderful blogs I discover along the way, the support I receive from that community, and from the more immediate community of my day-to-day life. 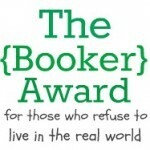 I know I will miss some bloggers who deserve this award and I know others do not accept awards. To the first group, I apologize and, to the second group, I am deeply grateful for your contributions. Posted in Awards, Blogging, Community and tagged awards, blogging, community, teacher as transformer. Bookmark the permalink. I received awards over the past week or so. I am quite forgetful sometimes and I apologize for the delay. I apologize in advance because I know I missed someone who is worthy of an award. I extend gratitude to Mary Clever, Otrazhenie, And Life Smiles, 4 Writers and Readers, and Chef Doru for the Very Inspiring Blog Award. Chef Doru also awarded the blog The Sunshine Blog Award. I coached ice hockey for almost 35 years and some former players made it to the NHL. My first language, although I don’t use it much anymore, was French. I am a teacher. My major is Physical Education which surprises few. My minor is French. I taught kindergarten for two days and believe every kindergarten teacher is a saint. Kathy and I met in a pub. I am very lucky to have met Kathy. My favourite TV show now is the Big Bang Theory. I laugh heartily. A Grateful Man Russ brings some kindness and truth into my life each day. tuttacronaca I don’t read Italian so am not sure what the text is about, but the pictures are great. Source of Inspiration There is incredible poetry and images on this site. Nae’s Nest is from a survivor who shares her story in poetry and images of various forms. Elena Caravela is an incredible artist with assorted interests and skills. Ese’s Voice shares thoughts, memories, and adventures. Luggage Lady shares poetry as she reflects on various aspects of life. On the Plum Tree is an author who is trying a new approach to publishing. The Essayist is sharing essays about various topics that matter. Candid Impressions mixes words with pictures and words that bring the two together. Toe Mail is what it is. You have to visit to fully appreciate the work being done. Sharmishtha Basu is a great set of sites of various forms of writing and art. Meiro shares her thoughts of life and music. The Secret Keeper shares many different writing elements it is impossible categorize the writing, but it is about finding truth. Posted in Awards, Blogging, Community, Writing and tagged awards, big bang theory, blogging, community, teacher as transformer, writing. Bookmark the permalink. I thank Nizy at Nizy’s Life Copendium and Cristi at Simple.Interesing for nominating my blog for “Blog of the Year 2012” award. I am grateful for this generous honour and the people who follow Teacher as Transformer. It has been a reflective, creative, and transformational journey for the blog and this blogger. This is a result of the wonderful blogs I discovered along the way, the support I receive from that community, and from the more immediate community of my day-to-day life. This next part I am unsure about, so I hope you will be able to follow better than I did. 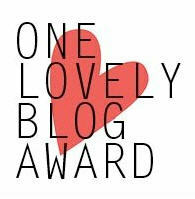 Unlike other awards which you can only add to your blog once – this award is different! When you begin you will receive the 1 star award, and every time you are given the award by another blog, you can add another star! Stay human friends. I find great inspiration in all the blogs I visit each day. Posted in Awards, Blogging, Community, Leadership and tagged awards, blogging, community, conversational journey, leadership, teacher as transformer. Bookmark the permalink. I am grateful to Marsha Lee who streams her thoughts in many ways and helps me navigate the shoals of this new community. She is a writer, innovator, and teacher on her blog. I acknowledge and invite several bloggers I was fortunate to find as I transformed my blog from an intermittent one without a focus to one with real purpose, I hope. I followed their efforts and recognized a blog is about connecting with me and, when that occurs, I will connect with others. I know a couple do not accept awards, but I wanted to acknowledge and thank them. I appreciate Melody at Meanwhile, Melody Muses. She is a wonderful poet and photographer. Her inspirational words and imagery convinced me the digital community was about an inner journey of self-discovery on a personal spiritual journey. A second blogger I appreciate is Mike at Mike’s Look at Life. Mike is a wonderful photographer who occasionally shares poetry. His photography is a journey of the daily life and its past. He reveals the extraordinary in the ordinary; those parts of daily life I often drove by. I appreciate is Yaz at Free Your Mind. She leaves many uplifting comments about my posts and shares the need to find one’s truth in both the good fortune and tragedy. She reaffirms a need to search and find community in her posts and frequent comments. I appreciate Carolyn’s posts on ABC of Spirit Talk and frequent journeys to my blog. She reminded me in her words that living my life as my life, rather than someone else’s life, is essential. Her ballroom dancing and her gently worded reflections speak volumes about her spirit. I appreciate Mimi at Waiting for the Karma Truck. She shares poetry, a love of music, and life experiences. Mimi responds to, as best as I can determine, every comment on her blog. She demonstrated blogs are a place of genuine conversation. I appreciate David at Lead.Learn.Live. We share some key ingredients-ice hockey is just a place to begin. David shares humour, quotes, and enthusiasm for life. My favourite posts are those at 4:00 AM when David is viewing the world more optimistically lens than I do. Posted in Awards, Blogging, Community, Writing and tagged awards, blogging, community, creativity, teacher as transformer, writing. Bookmark the permalink. 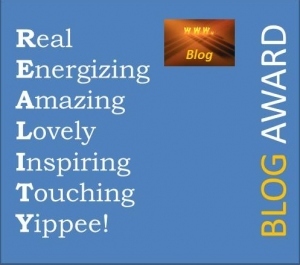 Tiny, from Tiny Lessons Blog nominated my blog for an award called the Reality Blog Award. I am grateful to Tiny. You can decide what you would like to do based on time and other considerations. There are no rules per se. I followed the template that Tiny provided, but each of us can follow our path on this award. I would have become a teacher sooner in life. This is two answers: 20 and 22. The first year was the year Kathy and I met and the second was the year we married. I handle the loss of those close to me well, but still it is the thing I think that scares me the most. I would finish my PhD, start a school, and write. I would be interested in being Jesus, Buddha, or Mohammed for a day. I nominated 20 different blogs I visit regularly. They include photography, poetry, prose, opinions, spirituality, etc. They are not the only blogs I visit, but I wanted to acknowledge a new group. I visit them and gain insight from their reality. This award does not go with any specific “rules”. Instead each nominee can do whatever feels good to them, but I hope they will take the nomination as a sign of appreciation and encouragement. Posted in Awards, Community, Uncategorized and tagged awards, blogging, community, teacher as transformer. Bookmark the permalink. I write about reciprocity in community which I find is just as real, albeit different in the digital world, when I get a chance. I appreciate those who follow, comment, and share their lives in small ways each day. Please take a few minutes and visit the links below. 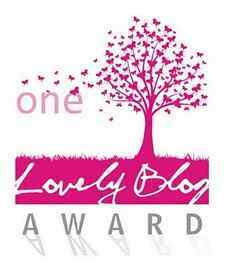 I am behind acknowledging nominations for One Lovely blog Awards I recently received. I apologize for the way I am doing this, but since returning to school and with other things on my plate time is at a premium. I would ask those who follow my blog to take a few minutes and check out these wonderful sites. They are great examples of well-done and eclectic blogs. I begin by thanking those who nominated me: Cimplicity Rocks, Mishmash, Nizy’s Life Compendium, and Poetry Blog of Mine. The rules for the award are straightforward and I believe help us create a virtual community. I take this time to thank these lovely bloggers, Cimplicity Rocks, Mishmash, Nizy’s Life Compendium, and Poetry Blog of Mine, for honouring me with the nominations. It is deeply appreciated and I am grateful for the wonderful examples of the ways social media are used for in today’s world and make it better; one post at a time. I was born and raised in Western Canada and am a life-long Albertan and British Columbian. My family traces its Canadian genealogy for over 20 generations. The first descendant we traced in my Dad’s family was a master barrel maker and member of the local militia in what is now Quebec City. I coached ice hockey for almost 35 years. Kathy and I met in a bar in Prince George BC. I might be related to Steve Prefontaine who was an American distance runner at the 1972 Olympics. We still do not know what connections there might be. I played goal in hockey which many people say explains my eccentric nature. 4. Include the blog award image in your post. There are two of them, so take a pick. Posted in Awards, Blogging, Community and tagged awards, blogging, community, conversational journey, creativity. Bookmark the permalink.